18″ x 24″ (45.72 cm x 60.96 cm) poster entitled “Lest We Forget” on semigloss photo paper. This poster was created to commemorate the 100th Anniversary of The Great War – The War to End All Wars (July 28, 1914 to November 11, 1918) and to honour the bravery and sacrifices of all those who fought in and all those who gave their lives for the freedoms we now enjoy. 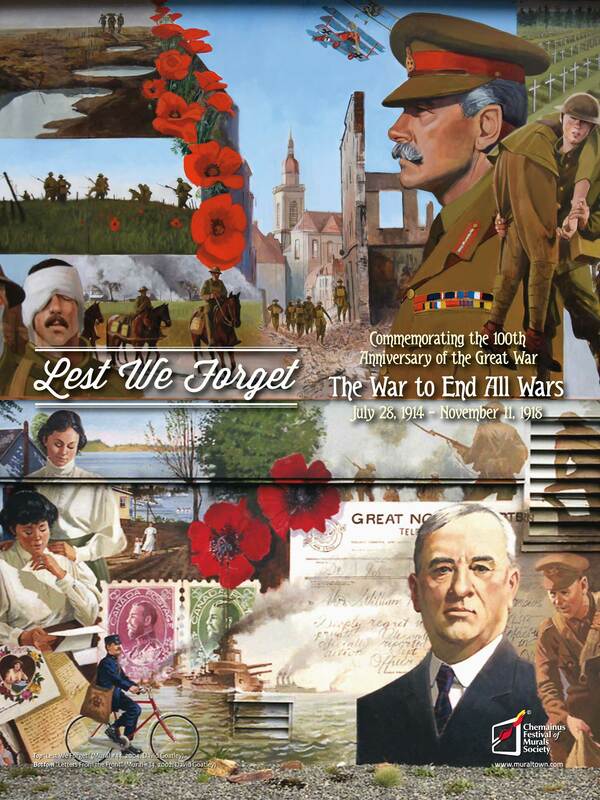 The outdoor art gallery in Chemainus proudly displays two murals – Lest We Forget and Letters From The Front – by distinguished international portrait painter, David Goatley, which highlight the perils of war. These two murals are presented in this poster. The poster is shipped in a 64.5 cm x 8.5 cm (25″ x 3″) square mailing tube.